The bedding just seemed to pull all the colors together. We bought fabric from High Fashion Homes in Houston and made our own bedding, using a few things from Pottery Barn (curtain panels) and Pottery Barn Teen (coco dot duvet cover). We mostly used baskets for storage, with homemade basket liners, and then some items were placed decoratively on the dresser/hutch. 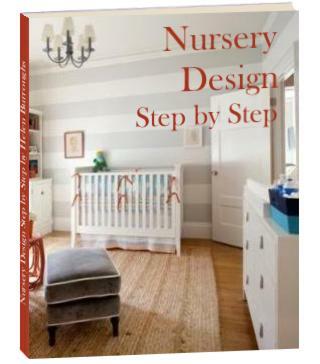 I planned the nursery, with help from my sister and mother in law; all the actual sewing was done by my mother in law. It took about 2 months of planning, finding fabrics and accessories, and then having the items made. 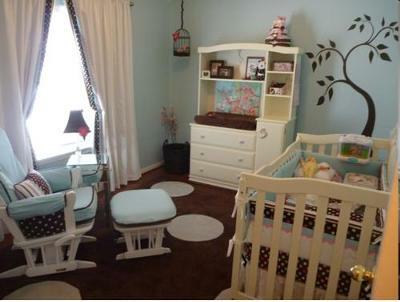 What I love most about our robins nest polka dots nursery is how pulled together it is, and the color scheme. We're having a second girl, and I just couldn't bear to do all the pinks and greens I did with my first daughter, so I was so happy to see that brown/blue/white with pink accents can really be feminine and fun and fresh! Of the many designs which I have seen over this site, I think this one is the classiest one. Whether it’s about the selection of paints, or even the furniture, everything looks so simple, but elegant at the same time. Was the Ben Moore paint actually called robins egg blue or robins nest? I'm looking at a color called robins nest to go with that exact bedding fabric and was wondering if that's what yours was? It's gorgeous - I love the colors too!